The following report was released by the United Nations Assistance Mission in Afghanistan on February 8, 2014. Armed conflict in Afghanistan took an unrelenting toll on Afghan civilians in 2013. The United Nations Assistance Mission in Afghanistan (UNAMA) documented 8,615 civilian casualties (2,959 civilian deaths and 5,656 injured) in 2013, marking a seven percent increase in deaths, 17 percent increase in injured, and a 14 percent increase in total civilian casualties compared to 2012. 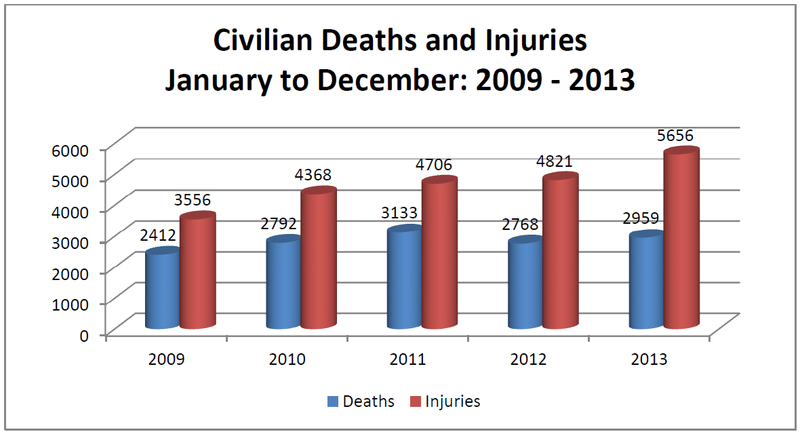 Escalating deaths and injuries to civilians in 2013 reverses the decline recorded in 2012 and is consistent with record high numbers of civilian casualties documented in 2011. Since 2009, the armed conflict in Afghanistan has claimed the lives of 14,064 Afghan civilians. UNAMA attributed 74 percent of civilian deaths and injuries to Anti-Government Elements, 11 percent to Pro-Government Forces (eight percent to Afghan national security forces and three percent to international forces) and ten percent to ground engagements between Anti-Government Elements and Pro-Government Forces. The remaining five percent of civilian casualties were unattributed, resulting mainly from explosive remnants of war. Mirroring the trends reported in UNAMA’s 2013 Mid-year Report on Protection of Civilians in the Armed Conflict, improvised explosive devices (IEDs) used by Anti-Government Elements particularly in areas populated or frequented by civilians was the main factor that drove the escalation in civilian casualties across Afghanistan in 2013. Increased ground engagements between Anti-Government Elements and Pro-Government Forces with civilians caught in the crossfire was a new trend with ground engagements causing 27 percent of all civilian deaths and injuries in 2013. UNAMA observed that 2013 was the worst year for Afghan women, girls and boys since 2009 with the highest recorded number of women and children’s deaths and injuries. Conflict-related violence caused 746 women casualties (235 women killed and 511 injured), up 36 percent from 2012. Child casualties increased by 34 percent compared to 2013 to 1,756 with 561 children killed and 1,195 injured. In line with the new trend of increased civilian casualties from ground engagements, 39 percent of all women and children casualties were from ground engagements which caused the most women and child casualties in 2013. While ground engagements injured the most women and children in 2013, IEDs remained the biggest killer of women and children. At the start of 2014, UNAMA reiterates the imperative for parties to the armed conflict, in particular Anti-Government Elements, to halt the worsening impact of conflict on Afghan civilians. Increased indiscriminate and unlawful use of IEDs by Anti-Government Elements killed and injured thousands of Afghan civilians as they went about their daily lives. Targeted killings of civilians by Anti-Government Elements and increased ground engagements between insurgents and Afghan national security forces put more and more civilians at risk of death and injury in their homes and communities. UNAMA again calls on all parties to the conflict to uphold their obligations under international humanitarian law to take all necessary measures to protect civilians from the harms of conflict. In 2013, Anti-Government Elements caused 74 percent of all civilian casualties, deliberately targeting civilians across the country and carrying out attacks without regard for civilian life. UNAMA attributed 6,374 civilian casualties (2,311 civilian deaths and 4,063 injured) to Anti-Government Elements, an increase of four percent compared to 2012. Indiscriminate and unlawful use of IEDs by Anti-Government Elements, the only party to the conflict that uses IED, increased and was the leading cause of civilian deaths and injuries in 2013, accounting for 34 percent of all civilian casualties. UNAMA documented 2,890 civilian casualties (962 civilian deaths and 1,928 injured) from IEDs, a 14 percent increase from 2012. Since 2009, IEDs in Afghanistan have killed or injured 12,504 civilians (4,515 civilian deaths and 7,989 civilians injured) in 3,716 separate IED attacks. UNAMA notes with concern the dramatic rise in civilian casualties caused by radio-controlled IEDs (RC-IEDs), documenting 356 separate RC-IED attacks. These devices caused 1,149 civilian casualties (257 civilians killed and 892 injured), an 84 percent increase from 2012. Civilian casualties from pressure-plate or victim-activated IEDs (PP-IEDs) declined by 39 percent from 2012 causing 557 civilian casualties (245 civilian deaths and 312 injured). While the decrease is noted, the human cost of PP-IED attacks in 2013 remained high. PP-IEDs were detonated in public areas used by civilians such as roads, markets, Government offices, bazaars, in and around schools, and bus stations. UNAMA reiterates that PP-IEDs as victim-activated devices – which are triggered by any person including children stepping on them or any vehicle driving over them such as civilian minibuses – are indiscriminate reinforcing its call on Anti-Government Elements to stop using them. Suicide and complex attacks resulted in 1,236 civilian casualties (255 killed and 981 injured) from 73 incidents in 2013. While the number of attacks remained similar to 2012, an 18 percent decrease in civilian casualties from these attacks was noted. Suicide and complex attacks accounted for 15 percent of all civilian casualties in 2013. UNAMA documented 1,076 civilian casualties (743 civilians’ killed and 333 injured) from 605 incidents of targeted killings. Anti-Government Elements increasingly targeted and killed civilian Government officials and civilians they perceived to support the Government including community and religious leaders, judicial authorities, tribal elders, election workers, off-duty police officers, and persons supporting the peace process. Threats and targeted attacks by Anti-Government Elements against mullahs (religious leaders) they accused of supporting the Government rose as attacks against mullahs and mosques tripled in 2013. UNAMA documented 25 incidents of attacks against election workers and election facilities by Anti-Government Elements during 2013, resulting in 16 civilian casualties (four civilian deaths and 12 injured). 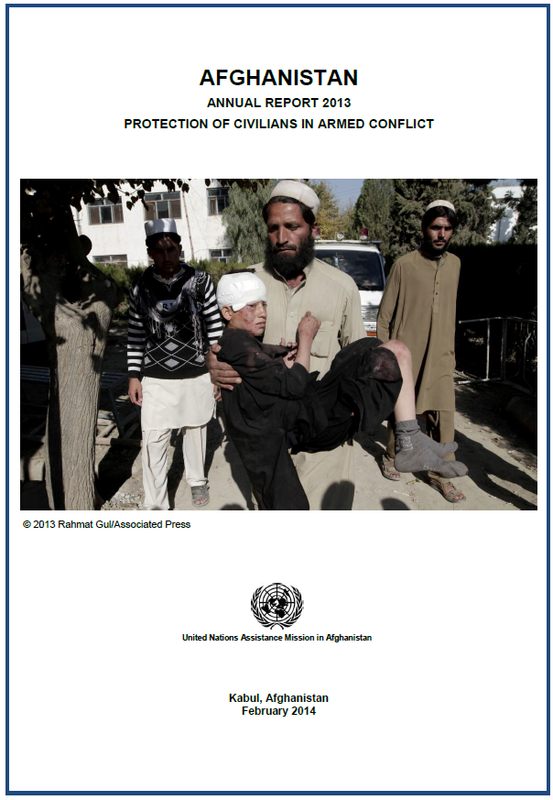 Throughout 2013, UNAMA noted increased public messaging by the Taliban on civilian casualties. However, the situation on the ground for Afghan civilians did not improve. The Taliban increased their indiscriminate use of IEDs and continued to attack civilians. In 2013, the Taliban claimed responsibility for 153 attacks affecting civilians, an increase of 292 percent in such claims by the Taliban compared to 2012. UNAMA’s verification found these 153 attacks resulted in 944 civilian casualties (302 civilians killed and 642 injured), reflecting a 136 percent increase in civilian casualties for which the Taliban claimed responsibility compared with 2012. Most of these attacks in 2013 used indiscriminate tactics such as IED detonations in public areas or directly targeted civilians or civilian objects, particularly civilian administration personnel and buildings. UNAMA highlights that indiscriminate attacks and deliberate targeted attacks against civilians are strictly prohibited under international humanitarian law which binds all parties to the conflict in Afghanistan including the Taliban. Attacks on civilians and killings of mullahs, elections workers, tribal elders and other civilians not directly participating in hostilities may amount to war crimes. The Taliban began publishing monthly statements detailing incidents of civilian casualties they alleged were caused by Pro-Government Forces. Of the 277 incidents listed by the Taliban, 91 had been documented by UNAMA, 83 were followed up by UNAMA and 103 could not be verified as involving civilian casualties from conflict-related violence. On 17 June, the Taliban announced the establishment of a “special committee under the supervision of the military commission for the avoidance of civilian losses.” The statement noted the committee was tasked with collecting information, investigating and referring incidents of ‘negligence’ by Taliban members to a sharia court. No public information has been provided to date on any action taken by this committee. UNAMA highlights that for such a mechanism to be credible, it must use the definition of “civilian” under international humanitarian law and promote compliance with principles and norms of international and national law. UNAMA documented 2,327 civilian casualties (534 civilian deaths and 1,793 injured) from 962 incidents of ground engagements between Anti-Government Elements and Pro-Government Forces particularly Afghan national security forces, a 43 percent increase from 2012. Ground engagements were the second leading cause of civilian casualties countrywide producing 27 percent of all civilian deaths and injuries, and accounted for the majority – 39 percent – of all women and children casualties in 2013. Of all incidents of ground engagements resulting in civilian casualties, 1,030 civilian casualties (266 civilian deaths and 764 injured) – 44 percent of civilian casualties from ground engagements – were attributed to Anti-Government Elements. UNAMA recorded 375 civilian casualties (99 civilian deaths and 276 injured) from ground operations of Afghan national security forces accounting for 16 percent of civilian casualties from ground engagement. Thirty-eight (38) percent of civilian casualties from ground engagements between Anti-Government Elements and Pro-Government Forces – 877 civilian casualties (159 civilian deaths and 718 injured) – could not be directly attributed to either party, an increase of 76 percent compared to 2012. This ‘fog of war’ dynamic reflects the changed nature of the conflict in Afghanistan in 2013 which was increasingly being waged in civilian communities and populated areas with civilians caught in the cross fire. The remaining two percent of civilian casualties from ground engagements were attributed to cross-border shelling into Kunar and Nangarhar provinces which resulted in 37 civilian casualties (nine civilian deaths and 28 injured). Three incidents of ground engagement which killed one civilian and injured seven (eight civilian casualties) were from an unknown source.